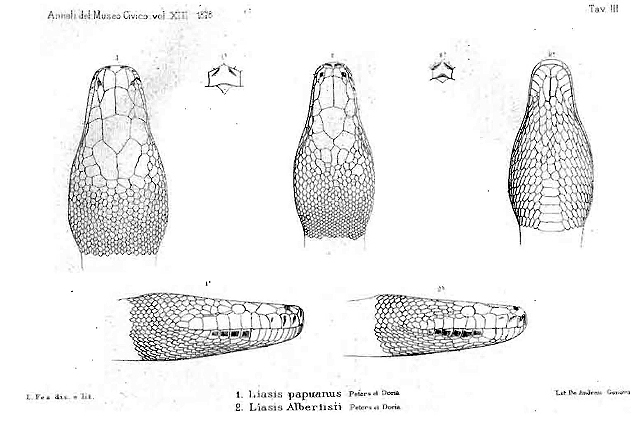 The first record of White-lipped pythons as Liasis albertisii was published in 1878 by the German Wilhelm Carl Hartwich Peters (1815-1883) and the Italian Giacomo Doria (1840-1913). Because of the morphological similarities, the two naturalists placed the new species into the genus Liasis Gray, 1842. The species was named in honor of Luigi Maria d’Albertis (1841-1901), an Italian ornithologist, who had undertaken expeditions to New Guinea along with the Italian botanist Odoardo Becari (1843-1920), thereby collecting a couple of specimens of this new species for museums in Europe.